It's time for another fun dog Giveaway just in time for Halloween. Anyone like Bret Michaels? Well if you do and you don't already know, Bret Michaels has his own brand of dog accessories sold at PetSmart! I've been lucky enough to receive a few of these products to give away to 2 lucky winners! These are genuine Bret Michaels design as well, totally rock'n'roll style! First we have this adorable rock n roll pet jacket that Oliver is wearing in the photo to the right. It's a size medium, but Oliver wore it quite comfortably' as well, at 10 lbs. So my guess would be any dog from 10 - 20 lbs could wear this, and look mighty adorable. 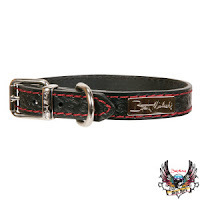 Second we have a very nice Bret Michaels dog leash made from real leather embroidered with red stitching for an extra edge. In order to win these fantastic pet prizes all you have to do is enter in the rafflecopter below. If you would like to see more from Bret Michaels pet brand and/or PetSmart visit their website, facebook page, and follow them on Twitter. Entries may be made on the Rafflecopter form at the bottom of this post. If you don't see it, simply click on the post title to refresh and it will magically reappear beneath the post. Entries will be accepted through October 11 and winners will be announced late on Friday, October 12. Good luck! Good luck! ur kid is so cute in that!!!!!! 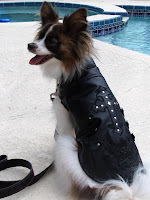 Bentley shows off his rock 'n roll style through his badass attitude (BOL)! Guinness just joined our family through rescue. He has a rock 'n' roll attitude and would love to strut his stuff in that jacket! Guinness is a 20lb dachshund/bully mix. Casey R. Doodle shows off his Rock n' Roll style every day, everywhere...it's there in his strutting walk, his rock star stance and prance, and in his Gene Simmons tongue. At around 85 lbs and with legs up to *there*, this dood was made for rock and roll. My beagle, Bru, currently does NOT show off his rocker style... but he desperately needs to! He's five months old and still acts like a little baby (okay, so he still is...). But I'd love for him to toughen up and roll with the big dogs with some Bret gear! 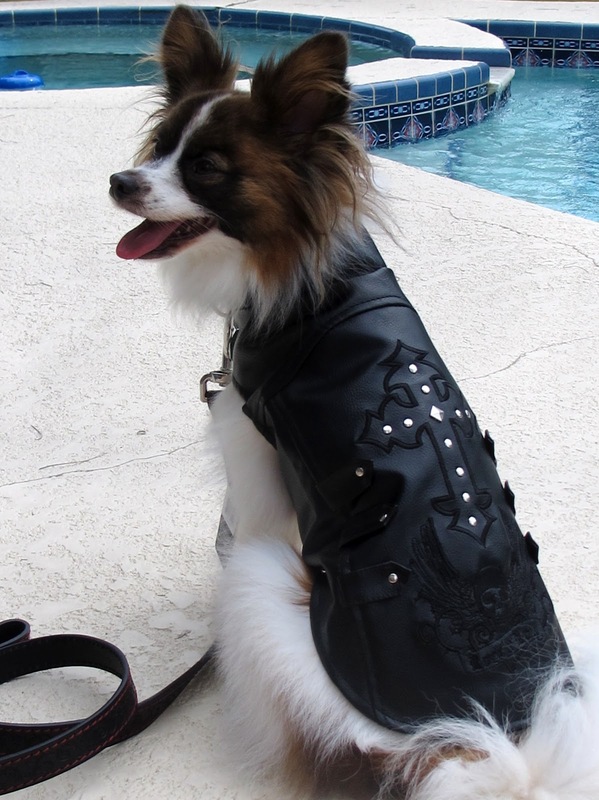 Artie wears his bad to the bone bandana and Kouga wears his harley dog jacket. Both dogs are about 80 lbs. Coco shows off her rock and roll style by wearing bandanas around her neck all the time. She has tons of them!!! She weighs 30 pounds. Nina uses a pink harley davidson leash (a little biker and a little rock n roll) but its really REALLY beat up so we could use a new leash to let her rock n roll side some out more! :P We'd take either prize to be honest but she is just shy of 30lbs. Charlie is 19 pounds and shows off by being tuff and barking! My 70 lb German Shepard (still a growing girl) likes to dance with my girls and I. She stands on her hind legs (with couch assist) and walks. Sissy shows off her style with her attitude. She is 23 lbs and a corgi/cocker spaniel mix. Cookie personifies the word "cool" and weighs about 20 pounds! My 10lb Jack Russell is all rock and roll with his jumps and attitude. My 15 lb. Miniature Dachshund shows his attitude by wearing his Harley Davidson jacket. hes small so like 11 inches? My friend's dog has a studded collar. I think it weighs between 15-20 pounds.